Home Reception Garden Wedding Win a Trip for 2 to Macau! Get a chance to win one of the two trips to Macau when you book Ibarra’s Party Venue and Catering Specialist. All 2015 Wedding Event bookers with minimum guaranteed of 150 persons are automatically entitled for an entry (one coupon per couple). Promo period is from January 1 to December 31, 2015. 2. 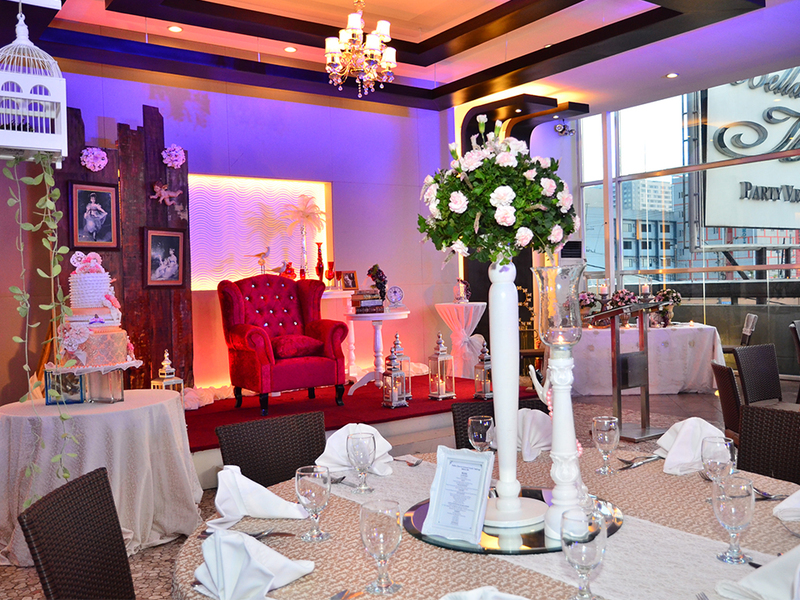 Applicable to Wedding Events availing Ibarra’s Wedding Packages with minimum guaranteed of 150 persons. 3. 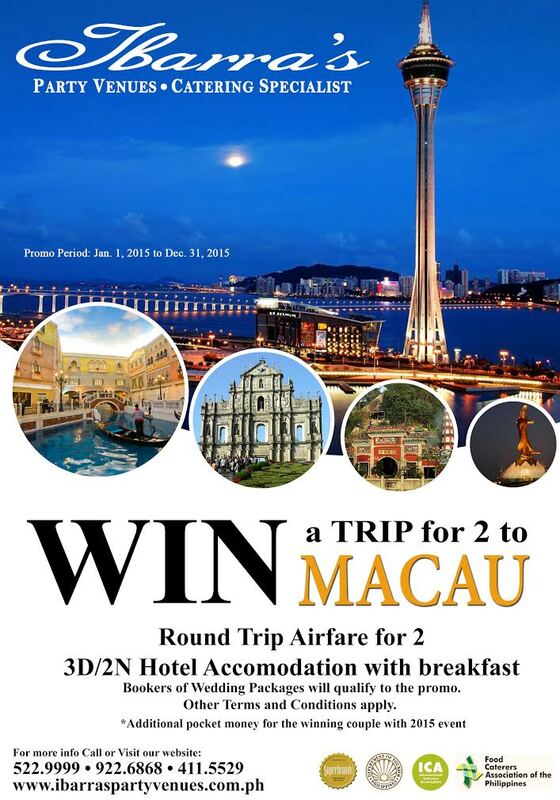 Drawing of winner: Only 2 lucky winners of 3D/2N Macau Package will be drawn. Non-winning entries from the first promo period are automatically included to the next and final draw. 4. Drawn winner will be subject to verification by Ibarra’s Management to authenticate their qualification to join the promo. 5. Winners will be notified via their branch of account and registered mail. The names of grand winners will be posted in our website www.ibarraspartyvenues.com.ph/news/ and our Facebook page and partners. 6. Raffle draw will be held at Plaza Ibarra, 77 Timog Avenue Bgy. South Triangle Quezon City at 12 noon. Prize inclusions: Roundtrip Airfare + 3D/2N Accommodation at Grand Harbour Hotel (point of origin and return must be an airport within the Philippines). Additional US$300 pocket money for the winning couple with 2015 event. Ibarra’s Banquet Sales Associate to inform their preferred travel date. Booking must be made at least 30 days in advance and is subject to airline seat availability. Any request for amendments or alterations is subject for approval of Ibarra’s Management. Rebooking or cancellation fees after ticket issuance shall be shouldered by the winner. Trip must be availed within 6 months from the date/time of Wedding Day. Standard travel restrictions, terms and conditions apply, including existing rules and regulations governed by Philippines & Macau Immigration. 8. Winners are given 60 days from the time letter of notification was received to claim the prize. All unclaimed prizes after the given period of claiming will be forfeited in favor of Wedding Resources & Events Management Corporation. 10. In case of conflict in the construction of these terms and conditions, the decision/interpretation of Ibarra’s Management herein shall prevail and shall not be appealable. 11. Claim of prize is valid upon full payment of account. You may call 522.9999 | 922.6868| 411.5529 for more details.